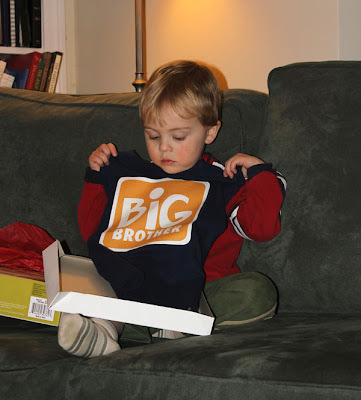 yes, sam is going to be an older brother. we are excited and/or frightened (depending on the time of day and behavior of the soon-to-be older brother), and are hoping the little bean will arrive just in time to mess up our scheduled trip to oglebay (arrgh!). by way of an announcement, we gave sam a special t-shirt for his birthday (which he has since worn to daycare and resulted in a rather humorous email from our daycare provider). 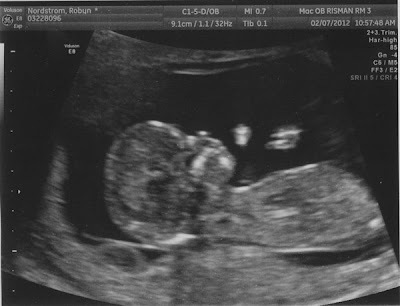 sam went to the first ultrasound with me and was convinced that he also had a baby in his belly (he also mentioned one in his head). he has since decided that this is a little brother (we don't actually know yet) and is named missy (sorry aunt missy, but probably not).